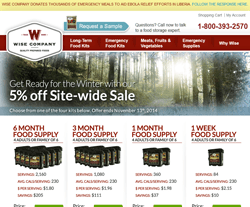 Wise Foods supplies a huge storage of emergency meals to aid people under urgent conditions. They take a creative way of providing long-term food kits, emergency food kits, emergency supplies, meats, fruits, vegetables and ready-made freeze dry and dehydrated food with reliable and high quality at affordable prices. All of their customers are satisfied with their excellent services.